Product prices and availability are accurate as of 2019-04-22 02:36:28 UTC and are subject to change. Any price and availability information displayed on http://www.amazon.com/ at the time of purchase will apply to the purchase of this product. The NOW Foods L-glutamine is one of the products that we recommend from a brand that we trust. In the Dog Cancer Survival Guide, Dr. Dressler states that glutamine can be beneficial for your dog as it ensures that your dog has the necessary fuel to rebuild the tissues that were injured from vomiting and diarrhea. Glutamine can correct these deficiencies and it ensures that your dog heals as quickly as possible. If your dog has brain cancer, do not give them glutamine (it actually feeds your dog's brain cancer growth BEFORE it gets to your dog's normal tissues!). 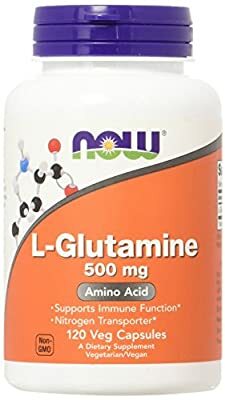 You should always check with your vet if your dog is having medical issues and before using glutamine as it is a potent supplement and it's not safe for all dogs. Glutamine has recently been the focus of much scientific interest. A growing body of evidence suggests that during certain stressful times, the body may require more glutamine than it can produce. Supplement Facts Serving Size: 1 Capsule Amount Per Serving % Daily Value L-Glutamine (Free-Form) 500 mg Suggested Use: As a dietary supplement, take 1 L-Glutamine capsule 1 to 3 times a day, preferably between meals. Free of: sugar, salt, starch, yeast, wheat, gluten, corn, soy, egg, milk. Other Ingredients: Rice Flour, Gelatin (capsule) and Magnesium Stearate. NOW L-Glutamine is the highest grade available, natural L-form amino acid.